Lyndon didn’t want to spend his summer at home, not after he got into an amazing summer camp on scholarship. But his Uncle Manny gets badly injured, so Lyndon’s parents make taking care of Uncle Manny his new summer camp. While taking notes as “homework,” Lyndon also drafts a letter to his friend Melody and muses on the past school year. Summer Camp is Cancelled is a coming-of-age about a young boy’s misadventures both during the summer, when he has to take care of his great-uncle, and during the school year, where he faces apathetic PE coaches, bullies, and an unrequited crush. What was your inspiration? My day job is tutoring and teaching college students of many different backgrounds. Throughout the years, I have had many students who were deaf or hard of hearing. Some of them communicated with me by writing on a board or on notebook paper like Melody does in the novel and some of them read my lips closely and spoke back to me. However, for whatever reason, there’s this common idea that if you raise your voice towards those who are deaf, that will help. That is NOT the case! Communication with those who are deaf/HOH depends on the person. Some use sign language, some use a board, and some speak. There is no one size fits all. Additionally, my father is completely deaf in one ear due to an accident much like the one Lyndon’s father had a child. My grandmother has been hard of hearing for several years as well. I’ve watched people become impatient and shout at my father and at my grandmother, too. It’s not a pretty sight and if it’s quite annoying to me, I can only imagine what it feels like for them and for those with the same condition. This is where the inspiration for Melody’s character came. As for apathetic PE coaches, bullies, and unrequited crushes – that was my daily life in middle school! How was writing Summer Camp different from writing Behind Mount Rushmore, your debut novel? It was easier in some ways, but hard in other ways. The easy part was creating the fictional town of Bat Springs because I’m a Texan, so I didn’t have to do much research for the geographical area or on Texan customs. However, I did have to do tons of research on children who are deaf, the 1990s, and Catholicism. This research consisted of reading several books, articles, watching informative YouTube videos, and conducting interviews. I interviewed over 40 people who were either devout Catholics or lapsed Catholics. Additionally, I interviewed over 20 people who are deaf or hard of hearing. Jessica Flores’ YouTube channel was a BIG help with research on deafness, too. Reading books and articles an watching videos are a great way to conduct research, but interviewing people is my favorite part because I get real, personal responses. For these specific interviews, I put out a call for interviews on some writing groups on Facebook. Within a day or two, I had numerous people messaging me their email addresses so I could send the questions over! I learned a lot about Catholicism and deafness in books, but these interviews taught me so much more. A lot of Lyndon’s life is colored by his grandmother and great-uncle, with how they insist on dominating their scenes and his life. What was most fun about writing those moments? Grandma Raquel was my favorite character to mold for this novel. She’s a sassy, no-nonsense, deeply religious, and strong woman who has the power to influence everyone around her. I created Lyndon’s character first and his parents second, but I knew they needed a matriarch of some sort to be the family boss. This is how Grandma Raquel was ‘born.’ Her scenes were my favorite to write because she’s such a bold character every time she appears. Uncle Manny’s character, on the other hand, is heavily influenced by one of my own uncles. Between the two, Uncle Manny is MUCH more tolerable! How much responsibility does Lyndon have for the drama that presides near the end of the book with Melody? There were a lot of red flags that Melody missed, on her part, and Lyndon seems more of a victim than an enabler. I agree he should have been honest, but he was honest in the beginning and she completely missed it. Lyndon is a good kid and he means well. He definitely should’ve been more honest with Melody, but he really thought he was doing the best for her. Sometimes in life, we try to do what we perceive is the right thing and it blows up in an unexpected way. Overall, Lyndon has a good heart. Lyndon at one point asks his dad why his parents never taught him Spanish, since everyone in his friend group can, and his dad responds that a hundred years ago, everyone in their family spoke only Spanish. How important is language in the role of family? Language is important to culture, but culture changes all the time. I grew up a trilingual household. My parents speak fluent Spanish, English, and Portuguese. So, my childhood consisted of English at school and at home, Spanish with relatives, and Portuguese at church or with our Brazilian friends – talk about a hectic language obstacle! I wish I had learned Spanish at an earlier age (I could understand Spanish as a kid, but I couldn’t speak it very well until high school) so my Spanish would be stronger today. I sympathize with Lyndon feeling like he’s not Mexican enough because he doesn’t speak any Spanish, but he is still Mexican by the blood of his ancestors and nothing will ever change that. Do you think Lyndon’s parents will cover next year’s summer camp fees in exchange for taking care of Uncle Manny, as they said they would to a disappointed Lyndon? Knowing them, they would likely want him to keep working at El Paso Paradise! What do you hope children and adult readers will get from this book? I hope readers will aim to be like St. Francis de Sales when they encounter someone who is deaf or hard of hearing. Instead of saying ‘screw it,’ as Lyndon puts it, I hope readers will stop and communicate patiently rather than screaming or dismissing the individual. Second, I would love for Protestant readers to realize that while Catholicism has its differences, the central message is the same. There’s no need to keep debating! Are there any autobiographical moments inSummer Camp? Yes! In chapter 7, the part when Lyndon is standing in Father Gonzalez’s way, is based off the time I attended Catholic Mass for the first time. I was raised nondenominational Protestant, so my knowledge about Catholicism until the last year and a half was next to nothing. There are three Catholic churches close to me, so I started my Mass resarch with the church just down the street. I arrived to Mass early and watched everyone around me to make sure I wasn’t making a fool of myself. I blessed myself, knelt when everyone else did, sang hymns along with the choir, etc. But, I had no idea that the priest enters from the back of the church – he does not enter the church from backstage like in modern, Protestant churches. So, when everyone stood up from their pews, I stood halfway in the aisle, unknowingly blocking the priest’s way until he said, “Excuse me, my child.” I was very embarrassed! I tried to not look like a fool, but it happened anyway. What upcoming works can readers expect? My next novel is currently untitled, but it stars a young girl named Ailani who is kidnapped and her journey to get home safely. Once Summer Camp is Cancelled is finally out on August 3rd, I’ll actually start focusing on my third novel more! 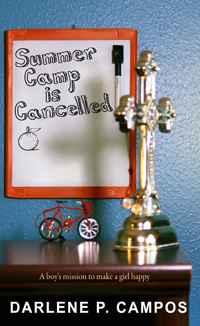 Summer Camp is Cancelled will be out in August. Be sure to Preorder a copy!